Thousands of Mazda 6 models are being recalled due to a potentially dangerous airbag fault. The problem is related to the metal inflator component, which may rupture and cause small shards to fly out when the airbag is deployed. >>>What is a DVSA recall? The defective part was produced by third party supplier Takata Corp, which has recalled tens of millions of airbags worldwide due to a design defect. BMW, Ford, Nissan and Toyota have already recalled thousands of vehicles in the UK due to the fault. Takata was forced to file for bankruptcy in late-2017, due to mounting compensation claims. 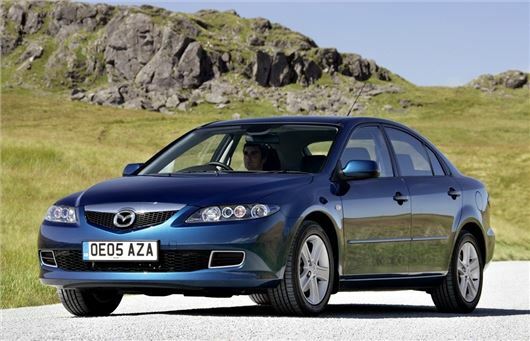 The latest UK recall affects 27,262 Mazda 6 models, produced from June 2002 to June 2005. Owners are urged to contact their nearest Mazda dealer to arrange for the airbag assembly to be replaced. Mazda will not charge owners for the work carried out. Mazda is also recalling around 1000 CX-3 and MX-5 models - built between 2015 and 2017 - over an electrical fault. Likewise, owners are urged to contact their local Mazda centre for the DCDC Converter to be replaced. Elsewhere, Vauxhall has issued a safety bulletin for almost 3000 cars due to a potential fire risk with the fuel line. The recall covers Insignia models, built between January to September 2017. Potential oil leak at gearbox breather, which may produce smoke and increase the risk of a vehicle fire. Rear seat latch could be released when the rear belts are not fastened, causing boot contents to enter the cabin. Mazda Mazda 6 Driver airbag inflators may not operate as intended. Control logic may fail to divert electrical power away from capacitor, which may cause DCDC converter to overheat and catch fire. Nuts attaching the busbars within prefuse box may not be installed. Crash protection plate for the high pressure fuel pump was not installed in three-cylinder petrol engines. Ignition Switch spring defect may cause engine to be turned off while driving. Clip of fuel line bundle might chafe against fuel pump hose, increasing risk of fire. F Y I - Jaguar range with the +£1000 up grade infotainment system re booting under its own violation whilst driving. for several seconds a blank screen. it happened to me in my FPace twice, once on the infamous stretch of road works on A14, adaptive speed control engaged system re booted adaptive speed control defaulted, luckily was able to apply brakes in time. Vehicle recalled because of this problem, three days in garage to apply software up-date before it took effect. Should this be on your list? I had a letter this weekend stating my Mazda 6 is to be recalled for the faulty airbag. Is there any way of compensation?